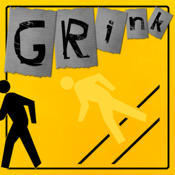 GRink is a puzzle-platforming game utilizing the ability to GROW and shrink to overcome obstacles and solve puzzles. Due to an unfortunate accident, ‘The Man’ from the crosswalk sign has been brought to life and must now escape from Dr. Tossalot’s locked-down laboratory. Freedom awaits the player with a clever mind and precise fingers! Be Excellent to Each Other!